On Monday, as it announced it would be wrapping up its investigation into Iran's pursuit of nuclear weapons, the International Atomic Energy Agency (IAEA) Board of Governors in Vienna received a report from the IAEA Director General bringing evidence that Iran had indeed been working towards building a nuclear explosive device up until 2009. 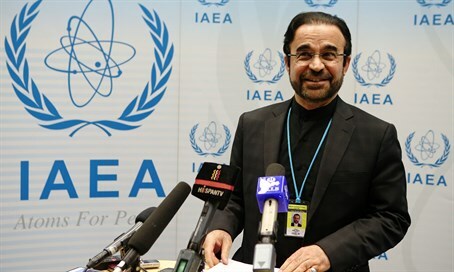 “This was one of the most important days in the nuclear Iran affair, and the IAEA board of governors did nothing” said a distraught Dr. Ephraim Asculai. The IAEA board of governors is a body made up of representatives from 35 members states of the 167 member states that comprise the IAEA. The findings of the report were presented after a long survey which the IAEA did on Iran to determine the PMD or Possible Military Dimensions of Iran’s nuclear program. “The report said that Iran had been working in a very organized manner on developing a nuclear explosive device for a number of years up until 2009," said Asculai, who worked at the Israel Atomic Energy Commission (IAEC) for over 40 years, mainly on issues of nuclear and environmental safety. In 1986, he went to work at the IAEA in Vienna on issues of radiation protection of the public. During 1990-1991 he was the Scientific Secretary of the International Chernobyl Project. In 1992, Dr. Asculai returned to Israel and became heavily involved in the deliberations leading to the conclusion of the Comprehensive Test-Ban Treaty (CTBT). He authored "Verification Revisited: The Nuclear Case", published by the ISIS Press. In 2002 he joined the Jaffee Center for Strategic Studies (now incorporated into the Institute for National Security Studies). He has since published several papers dealing with WMD non-proliferation in general, and Middle East issues in particular. Iran, for its part, has always denied this. However the IAEA report now states very explicitly, that Iran was lying and working on a PMD nuclear weapon. “The report was submitted, and everyone nodded, and no one did anything about it. Nothing was said. It was accepted as is, and then people said let’s move on. It is absurd,” said Asculai. Asculai said that the United States in particular doesn’t want to do anything about it, and that their negligence and apathy is dangerous. “This precedent paves the way for anyone to develop nuclear weapons,” he explained.